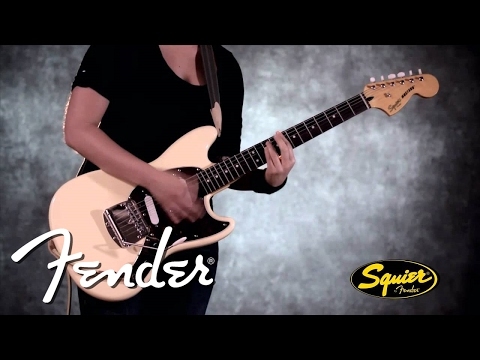 The Squier Vintage Modified Mustang electric guitar is the first Mustang to be included in the Squier family. The classic features that made the model so beloved in its Fender form are present including the 24" scale, extensive pickup switching options, and vintage vibrato. These classic features have been included alongside modern appointments to make the model a must-have for every guitarist. The body has been crafted using lightweight basswood, and shaped to the effortlessly cool Mustang profile. The double-cutaway body shape makes it easy to access the neck and fingerboard in their entirety. The body has been treated to a vintage white finish, which is complemented by the 4-ply tortoiseshell pickguard. The chrome hardware features the much-coveted floating bridge design with a classic vibrato tailpiece that made the Mustang such a popular model. The bridge secures the strings to the Squier Vintage Modified Mustang while providing a vintage tremolo for added pitch manipulation to infuse individuality into each performance with ease. Fitted to the body is a slender "C"-shape maple neck, which offers a smooth and very comfortable playing feel. The Mustang neck has a 24" scale length - making it shorter than that of a Strat or Tele neck -, which some players with smaller hands, or who prefer a shorter reach appreciate for its comfortability. Paired with the neck is a rosewood fingerboard, which is shaped with a radius of 9.5", which makes performing seamless string bends easier, as does making deft chord-transitions and sweeping arpeggios. The Squier Vintage Modified Mustang is equipped with two Duncan Designed MU-102 single-coil pickups in the neck and bridge positions. Both pickups have independent on/off switches, as well as phase slider switches. As well as the this there are the standard master volume and master tone pots, and the entire setup offers enhanced tonal versatility, and allows for many different tones. If you're looking for a versatile electric guitar that combines vintage-style with modern appointments to perfection, then the Squier Vintage Modified Mustang electric guitar is as close to perfect as you can get. Posted on 01/04/2014 by Gabe This is a real Mustang, with a real Mustang price. It sounds amazing and is great for playing songs by Nirvana and other Grunge bands. There was a problem with the bridge rattling, but I had that fixed (for free) and now it sounds better than ever. If you want a not too expensive guitar with great sound, this is definitely the one for you.